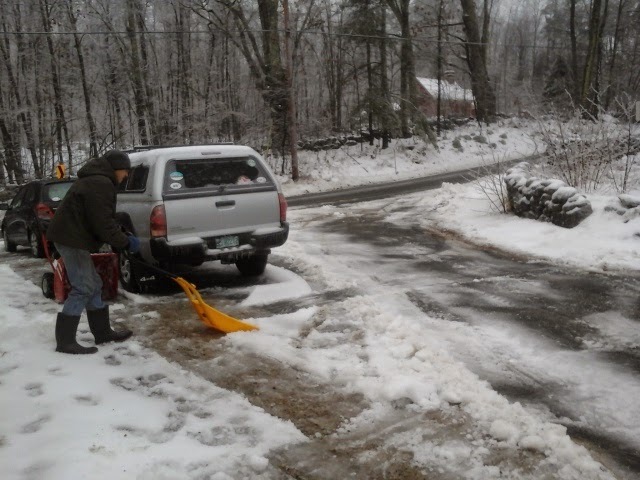 This was four inches of ice and slush and very hard work to move. Neighbor Carl to the rescue! Thank goodness for Carl's help . Last nights snow turned to sleet turned to freezing rain, with the result being about 4 inches of ice and heavy slush everywhere. 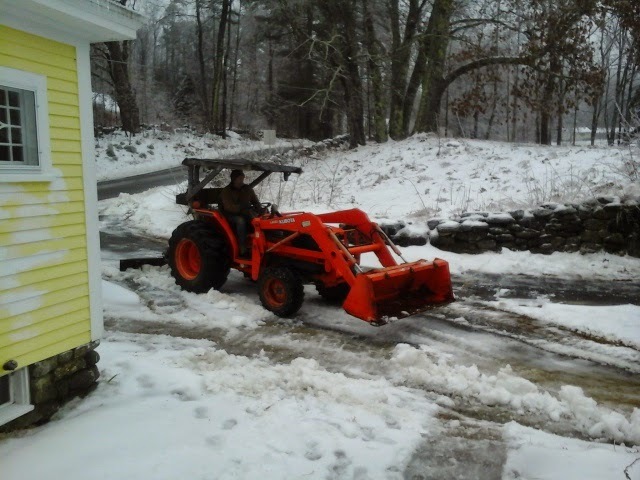 This stuff is a backbreaker to move, and due to some other obligations, it was going to be almost impossible for us to finish before dark, and its going to freeze solid before morning. 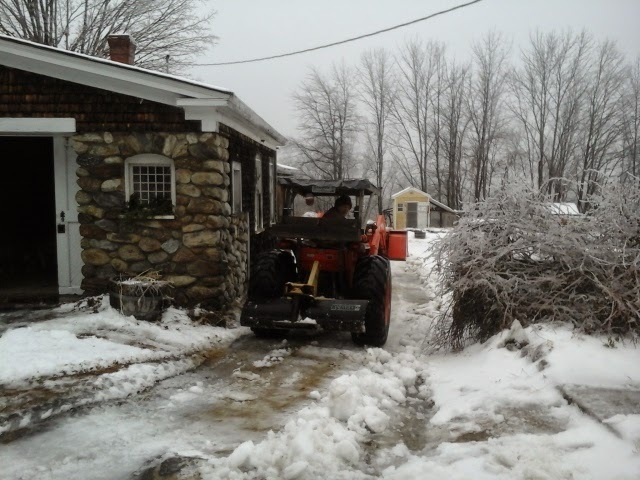 Our wonderful neighbor showed up with his tractor to help. Its not the first time he has shown up, unasked, ready to do whatever was necessary. I think many folks who set out to homestead have a self reliant attitude, and thats necessary to a great degree. But perhaps one mistake that gets made is the idea that we can head out to the country and make it all on our own. In actuality, we need community. Its why towns and villages cropped up in our history... folks gathered to share labor, for safety, and to barter goods and services. Each of us brings a certain set of skills and knowledge to the table, and everyone is enriched when we can share them. Its an old model that works. Our society today doesnt lend itself to this kind of community for the most part. We are disconnected and isolated, even if we live right next door. I have been reminded of the need to purposefully connect with others since moving back to this rural part of the country. Tonight, after the driveway was cleared, we drove to a gathering of friends for a potluck and yankee swap. Most everyone there lives in one small town, and community is alive and well. One young couple announced their engagement, and afterwards, as we were admiring the bride-to-be 's new ring, one of the folks offered to grow the flowers in her greenhouse if they had decided what kind of flowers they wanted for the wedding. A small thing, yet not so small, and to me it epitomized the simple connectedness that makes life so much better. I want to get better at building community-its way too easy to close our doors and focus on me, myself and I.
Wildlife: no unusual sightings today, just the regular birds at tje feeder. Daily run: we ran to church and back, 6.3 miles total.